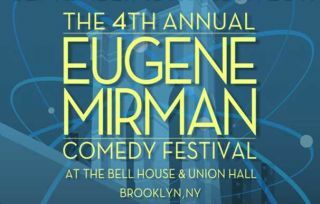 Logo of the Eugene Mirman Comedy Festival. BROOKLYN, New York — Science and comedy united in what became a virtual game of "ask the astrophysicist" in the science-themed opening night of the Eugene Mirman Comedy Festival last night (Sept. 15) at the Bell House bar and theater. The night's show, broadcast for astrophysicist Neil deGrasse Tyson's "Star Talk" podcast, brought together "people hewn from pop culture to explore how science influenced their life," Tyson, director of the American Museum of Natural History's Hayden Planetarium , explained. The panel, co-hosted by the comedian Eugene Mirman, also featured Scott Adsit ("30 Rock"), Kristen Schaal ("Flight of the Conchords") and surprise guest Alan Alda ("M.A.S.H. ", host of TV's "Scientific American"). "There's a lot of belief that goes before evidence" when it comes of people's attitudes toward science, Alda said during the panel, a theme that ended up running throughout much of the evening. Tyson's list of questions for the panel — or rather, mostly metaphorical questions that he was able to answer himself, as the comedians, true to form, provided more comic relief than actual insight to astrophysics — ranged from "how do you define life?" to "What are all the ways the universe wants to kill us?" The answers to the latter, it seemed, turned out to be vast. While humans tend to think of the Earth as a climatically hospitable place, he said, it isn't necessarily so. Tyson asked the audience to imagine a place that requires a constant need to shield yourself from the elements by building shelters and wearing garments for protection from sunburn and frostbite. That place is Earth, he said. So when people think of our planet as naturally the most ideal place in which humans could live, it's not really the case, Tyson said — thus opening the possibility of humans being able to live on other planets in the future. Another theme running throughout the course of the evening was questioning the science behind black holes. When an audience member asked Tyson in a Q&A segment why one wouldn't be able to physically enter a black hole and come out whole on the other side, he explained that, like a tube of toothpaste, anything entering the black hole would be shot through the abyss and ultimately disintegrated. Schaal, playing devil's advocate, told Tyson she wouldn't mind hanging out near a black hole. When Tyson affirmed the impossibility of such and asked her how she would do such a thing, Schaal cheekily said she'd be a beam of light. "Even light beams can't survive," Tyson reminded her. Life throughout the universe, the panel concluded, is not easily defined, and whether life actually exists elsewhere on an Earth-like planet is difficult to prove. As for the possible existence of alien life-forms in other galaxies far, far away? "I saw the Republican debate the other night. I think the aliens are here," Alda joked.